You can really help the railway (and yourself) by volunteering! We have a whole railway to operate (well, two really!). It doesn’t matter whether you have a day, a week, or longer to devote to the Ffestiniog Railway, we have jobs that will make you feel your visit is worthwhile. You can learn new skills for free, meet new friends and really make a difference to the railway. You could be out in the fresh Welsh air, maintaining the track amongst stunning scenery; you could be maintaining and training to operate, our large collection of steam and diesel locomotives that date from 1863 to the present day; you could be operating our signalling and telephone system which goes from Strowger relays to fibre optics; if you want to meet people, then come to be a guard or serve refreshments from our buffet cars and shops. All of the tasks provide the opportunity to be part of the Ffestiniog family, and give you the enjoyment of being part of a busy team running a railway in the very beautiful environment of North Wales. For all sorts of reasons, a wide cross section of people (of all ages) find working for the Ffestiniog not only satisfying, but very fulfilling; making new friends and expanding their social lives alongside the satisfaction of a day’s work well done. Help FRS in the Summer! There is a particular need for volunteers during the busy period of High Summer, but all year round there are openings for volunteers – just like you! In every case, training will be given to enable you to carry out your job. Many volunteers find they learn new and useful skills that are of benefit in the world away from the railway, and may even help with job applications, where potential employers look very favourably on volunteer work of the sort offered on the railway. Address: Ffestiniog Railway, Harbour Station, Porthmadog, Gwynedd, LL49 9NF. 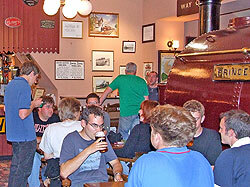 You may know exactly what you hope to do when you visit the railway. 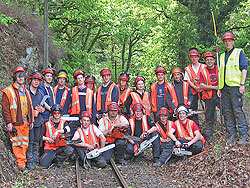 If you have existing skills you may wish to use them when you visit the railway. 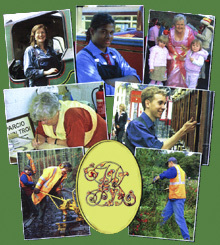 The following pages describe the various departments and groups on the railway. If you are unsure or looking for a chance to do something quite new we have our own Volunteer Resource Manager, Tricia Doyle: volunteer@ffwhr.com who can help you get that first step into volunteering. If you need somewhere to stay then we have our own hostels which offer self catering accommodation at a good rate and of excellent quality. At the end of the day, come and enjoy a meal a drink and a chat with your new friends at our very own pub (which has won the local CAMRA best pub award for the last 3 years). You need never be alone on the railway!